Explore Ancient Rome discovering hidden treasures in this stunning Match3 Adventure. Are you ready to do your duty for Rome? Help Caesar’s bravest Centurion take on the ultimate challenge and rescue his beautiful wife who has been kidnapped by the evil Marcus. With your comrades at arms by your side, journey across Ancient Rome, from Capua to Ostia, in this engaging and challenging Match 3 adventure. Call upon the unique skills of your trusty Legionnaires and travel across the great Republic, to rescue your bride from a fate worse than death and solve the riddle of the priceless hidden artefact. 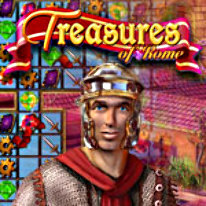 Packed with unique bonuses and 100 levels of pure jewel matching fun, Treasures of Rome is set to be more challenging than the Gladiators in the Colosseum.